This bronze bowl inscribed with the words “Gwanggaeto Daewang” was discovered at the Houchong Tomb (Tomb No. 140), one of two ancient Silla tombs excavated in 1946, located in Noseo-dong, Gyeongju. 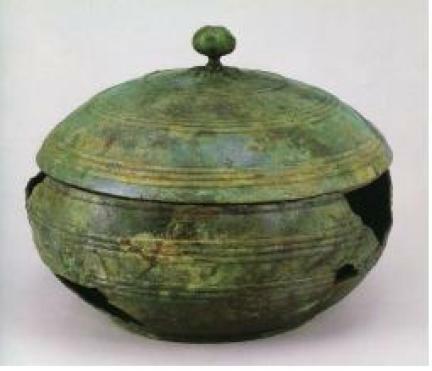 Currently kept at the National Museum of Korea, the vessel features a squat globular body and a similarly shaped semi-spherical lid with a lotus knob. The bottom of the vessel features an inscription of sixteen Chinese characters arranged in four lines of four characters. The inscription is an interesting source of information on the active trade links and political relations between Goguryeo and Silla, which resulted in the burial of this Goguryeo vessel in a royal tomb of Silla. It is also highly regarded as a rare example of Goguryeo metalwork with an inscription containing valuable chronological information about tombs of the Three Kingdoms Period.